Cyprus is culturally determined by all kind of ‘multi-‘: Multi-ethnic, multi-lingual, multi-religious. This diversity has sometimes resulted in new hybrid forms, sometimes in atrocities about the right creed/language/nationality. 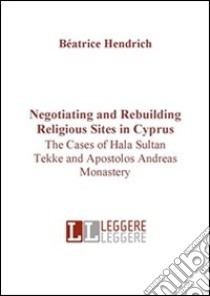 The history of ‘contested sites’ in Cyprus is long. Soldiers and rulers of differing Christian confessions fought for the possession of the island including its many churches and monasteries. With the Ottoman conquest in the 16th century, some major Gothic churches were turned into mosques, but at the level of popular practice and belief, graves and chapels turned into sites of ‘double use’ by Muslims and Christians. This coexistence and interblending continued –not always unchallenged of course– until the warlike situation after Cypriot independence in the 20th century.